John has been working in theatre since introduced to the world of production in high school twenty years ago. After college he got his Master of Fine Arts in Theatre Technology from the University of Wisconsin-Madison and was hired by Ithaca College as their Technical Supervisor. In 2000 John become the Technical Director for the University of Pittsburgh Theater Department and helped guide the two million dollar renovation of the Stephan Foster Memorial Theater. In 2003 he was hired by Slippery Rock University to be the Technical Director/Facilities Manager at Miller Auditorium. John worked closely with the Theatre, Dance and Music departments creating successful events and productions. Working also with the special events office John was part of making many concerts and special events successfully come to life for Slippery Rock audiences. 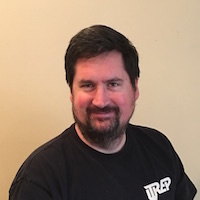 After returning to Pittsburgh in 2000 John also began freelancing, working for lighting production companies and local theatres’ as a master electrician, technical director, sound designer, lighting tech and other positions. As part of that work he is proud to have been involved with some major events including Pittsburgh Pirates Sky Blast, UPMC Hillman Cancer Center Galas, Robert Morris University Commencement and the Evergreen Healthcare Gala.